Brooklyn’s own “Starving Artists Guide,” a website created by musician-writer Johnny Sanford, plans to create a bridge between free condoms and art this fall. His Condom-Catcher contest, which is open to anyone that considers themselves a starving artist, will be aimed at straphangers on the subway and buses alike. “The plan is to have artists from around New York City create cardboard cut-out condom dispensers,” Johnny said. “I like the idea of cardboard because it is so disposable, just like a condom. If police take them down, so what?” The condom-dispensers will be put up with zip ties around bus stop signs and in subway stations. The designs will be uncensored and limited only by the artists imagination. Johnny did make it clear that he would put them high enough so that children cannot get to them. 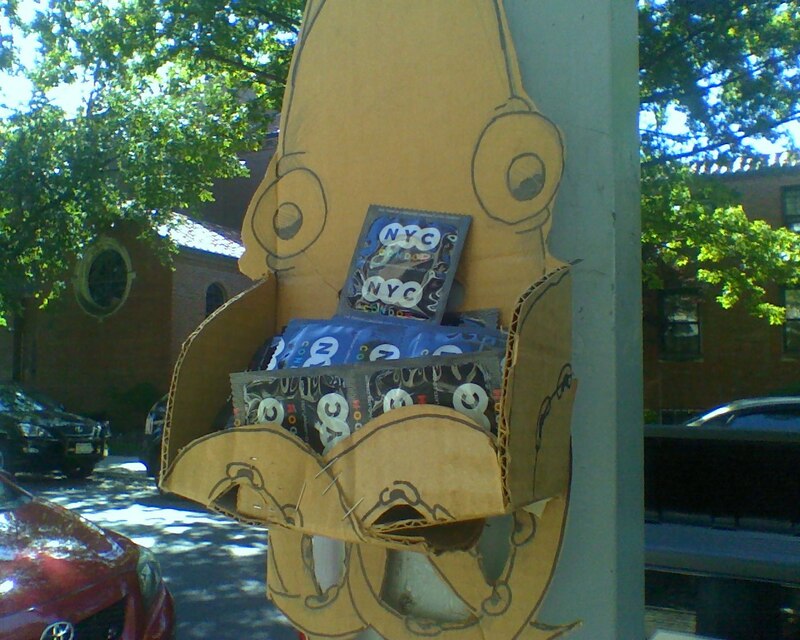 One dispenser that recent transplant Laura Worrick designed is aptly titled the “Partysaurus Squid.” (see picture) The tentacles of the squid come up into a box-like holder that is perfect for placing a handful of condoms. Today marks the start of the contest, which isn’t really a contest at all. “The aim is to get people who don’t have condoms a free condom, and add a little bit of theater and creativity to it,” Artist and frequent collaborator with starvingartistsguide.com Sean Kenealy reported. Loyal fans and artists alike plan to put up the condom dispensers on Halloween night. So, get out a piece of cardboard and a box cutter, folks. Artists interested in participating in the contest can email starvingartistsguide@gmail.com in order to get a handful of condoms and a free gift for helping the initiative. “The Starving Artists Guide To New York City,” a book written by Johnny after 2 ½ years of experience in living on the edge of poverty and aimed at helping today’s starving artists, comedians and musicians get gigs and a slew of other helpful resources as well is scheduled for a release with self-publisher lulu.com on Oct. 31st, 2009. More information about the book and contest can be found at www.starvingartistsguide.com. NextIt’s Official, I’m leaving it up to the Masses!